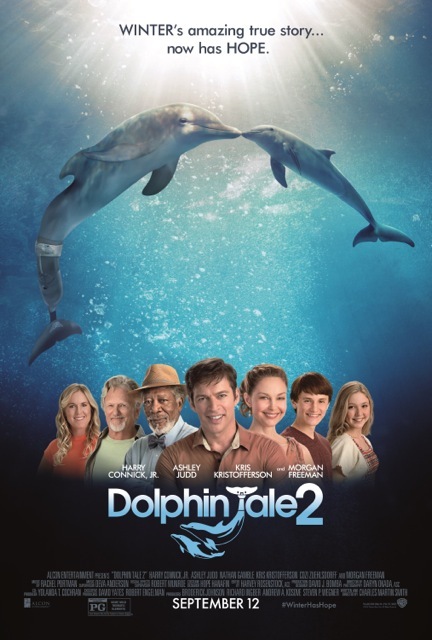 We have a few pairs of tickets to see Dolphin Tale 2 before it is released in theaters! Passes are first come, first serve, go to Gofobo and use the code CINE79L3. Several years have passed since young Sawyer Nelson (Gamble) and the dedicated team at the Clearwater Marine Aquarium (CMA), headed by Dr. Clay Haskett (Connick, Jr.), rescued Winter, a young dolphin who lost her tail after being entangled in a crab trap. With the help of Dr. Cameron McCarthy (Freeman), who developed a unique prosthetic tail for Winter, they saved her life against all odds. In turn, she helped save the Aquarium—as people came from far and wide to see the courageous dolphin firsthand, enabling CMA to greatly expand their mission to “rescue, rehabilitate and, when possible, release” injured animals. Yet their fight is not over. 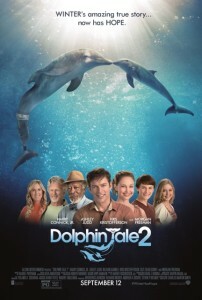 Winter’s surrogate mother, the elderly dolphin Panama, passes away, leaving Winter alone and grieving, unwilling to engage with anyone, even her best friend, Sawyer. However, the loss of Panama may have even greater repercussions for CMA. The USDA warns Clay they will have to move Winter from the Aquarium because regulations require these social creatures to be paired. If they don’t find a female companion for her—one that she accepts—CMA will lose their beloved Winter.